Almost as soon as we turned the page in the calendar, the fall migration accelerated to an incredible pace! Unusually consistent north and northerly winds helped to push large numbers of birds through Pelee Island and into PIBO’s mist-nets, with over 100 birds being banded on both September 2nd and 3rd and over 90 being banded on September 6th. The banding totals didn’t drop below 50 birds until September 12th, and the daily number of species observed remained fairly stable, ranging between a low of 54 and a high of 62 species each day. During the early days of September the warblers were in ascendance, making up the majority of the birds banded and observed. Many Cape May Warblers were seen during September 1st and 2nd, although only one was banded. Overall, Magnolia Warblers and American Restarts were the warbler species that were the most numerous, though Bay-breasted and Blackpoll Warblers became more common from September 5th onwards. Twelve Tennessee Warblers were banded on September 3rd. The first Common Yellowthroat was seen on September 5th and 3 were banded on September 10th, which was an unusually high number for that particular species. The first Mourning Warbler was seen on September 6th. The first Northern Parula for the season was banded on September 8th. The first Blue-winged Warbler and Western Palm Warbler appeared on September 9th. From September 5th onwards, the Catharus spp. thrushes that make up the majority of PIBO’s banding in the fall became to show up in large numbers. The first Grey-cheeked Thrushes of the season turned up on that day, and have been banded on every day since then. Gradually, Swainson’s Thrushes began to rival the Magnolia Warblers and the American Redstarts as the most numerous species banded, and eventually outstripped them. Wood Thrushes were also common. In spite of the large numbers of birds being handled each day, almost none of the birds that were banded remained around the netting area to be recaptured on subsequent days. After 128 birds were banded on September 2nd, one single banded Magnolia Warbler was glimpsed briefly the next day, but the only birds that were recaptured were a family of young Carolina Wrens that had been banded in August. The only migrants that were recaptured were four warblers that were banded on September 5th and 6th remained on the island long enough to be recaptured on the 8th, and two thrushes that had stayed on the island for two days each. Following the thrushes, the Sharp-shinned and Cooper’s Hawks began to turn up in the trees around the netting area, swooping and making swipes at each other as they waited for their chance to grab an unwary songbird. The first Lincoln’s Sparrow was banded on September 11th and an Eastern Towhee was observed on September 13th, but very few other sparrows have been seen. Sparrows and kinglets habitually migrate later than the thrushes and warblers, so more of them will begin to appear later in the season. By the time September 15th rolled around, the pace of the banding had decelerated to the point where we captured only 20 birds, most of them thrushes. All told, we banded 1050 birds from September 1st to September 15th. Considering that we captured 659 birds this spring, and that our total from both the spring and fall banding in 2016 was 2584 birds, this is a substantial number! It remains to be seen whether this represents the bulk of the fall migration, in which case we have some very slow days ahead of us, or whether this has been a boom year for migratory birds and we can expect another round of busy days in the weeks ahead. The PIBO banding station at Fish Point is open every day (weather permitting) from approximately 7 a.m. to 11:30 a.m. Please feel free to drop in and say hi! 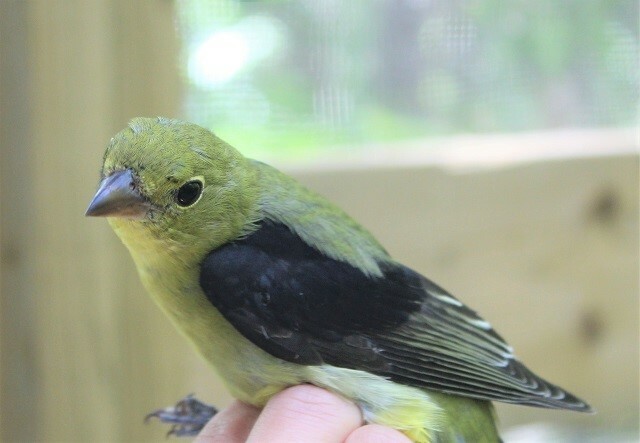 A male hatch-year Scarlet Tanager, banded September 7th. Photo by Sumiko Onishi.